Many weeks back i posted about the full specifications and price of the samsung galaxy s5 in Nigeria, A lot of people have been enjoying the new features packed in the new Samsung galaxy s5 but Glo Nigeria is even making it better through their partnership with the Manufacturers of the mobile device to provide exclusive services to users of the Samsung Galaxy S5 on the Globacom Nigeria platform. 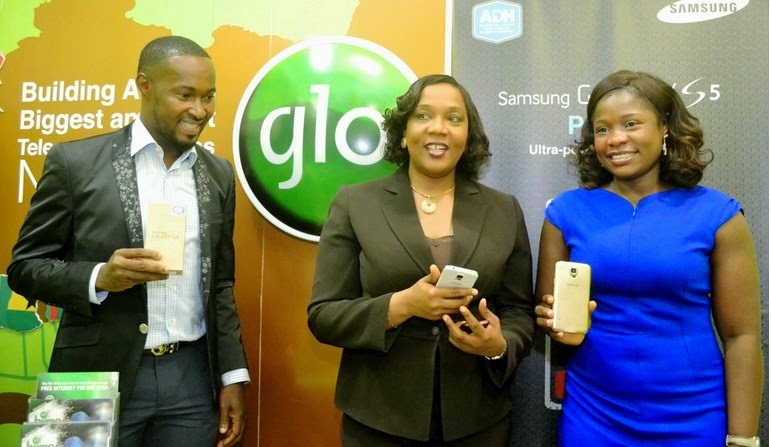 Just of recent, Globacom in collaboration with Samsung electronics, organized an in-store activation experimental activity on Samsung Galaxy S5 to customers in Glo's flagship chain stores at different locations around Lagos. According to Glo Staff, Akhigbe - Glo NG will be giving out free 1GB data valid for 6 months to all the users of the new device- Samsung Galaxy s5 on the Globacom Network in Nigeria. This is a great deal in my own opinion, owing to the fact that these smartphones consume a lot of data as you engage with them, the free 1 GB data from Globacom Nigeria is surely a great offer enough to get you busy with your phone for the time being. I hope you enjoyed this post, don't hesitate to share it on your social networks.